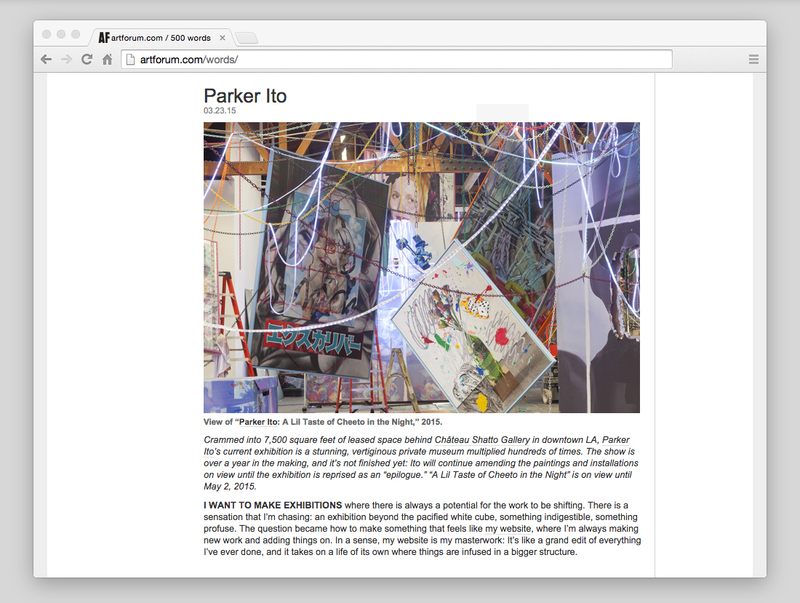 On the occasion of his new solo exhibition entitled A Lil Taste of Cheeto in the Night, American artist PARKER ITO talked to CHRIS KRAUS for Artforum about how he constructed and came to this two-year project that is currently on view at Chateau Shatto in Los Angeles. I also really recommend to read MAXWELL WILLIAMS’ article for the NY Times Magazine who explains ITO‘s process and attempts for this exhibition. Be sure to catch in person the chapter 3 of A Lil Taste of Cheeto in the Night at Chateau Shatto before it closes on May 2, 2015.